Libraries are interesting semi-public institutions and spaces to me. As my works they are fundamentally based on the assumption of shared use over time. I've always found these buildings to possess a certain magic and felt a strange sense of awe for the huge and somehow systematically organized collection of information over time. On the other hand I have never really 'lived' in libraries enough to feel at home and at ease in them. To me they hold promises of the new as well as danger. In November 2003 I felt the need to create explorational works in which I engage with the Mills College Main Library. This might have been partly inspired by my studies at the time of different site-related practices in general, like those of the Situationists in Paris in the nineteen sixties, and the 'dérive' in particular. The main work to me was the following improvisational performance and exercise, that happened without a knowing audience. I started at the entrance and had made up the rule, to move through the library space in a non-planned manner, according to where the building seemed to want me to go, and make a photo of where it would eventually lead me. The building not necessarily being an independant live organism of its own, I assumed that it was the whole of the architectural design, the way it was spatially and functionally organized and used by the related authorities, staff and users (that had resulted in a certain set of formal and energetic characteristics) which 'suggestions' I would be following on my wandering. It's actually not unusual at all for me to set off on explorative improvised wanderings from time to time; but this was the first time I made it such a formal experiment, and placed it in the context of art. The consequent journey led me up the stairs to the upper, second floor level, and zigzagging a certain way through the rows of bookshelves eventually put me in front of a window. 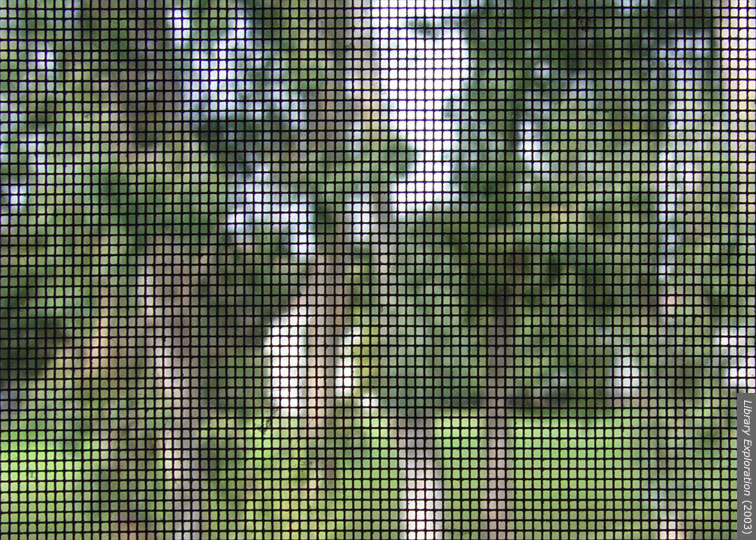 First noticing a fine, raster like, slightly dirty fly screen, through it I could see a view of a row of luscious trees on the other side of the parallel road, and behind it the spatious greens as they were found on campus. So I learned that buildings can have somewhat accidental 'preferred' routes within them; and the photo I took of the view at the end allowed me to look at libraries as logically organized collections of books, who in their library order and in their contents themselves are organized representations of an outside world. An explorative performance according to a simple chosen rule; aimed at learning about the building of a public library. A photo made at the resulting end point.